Just Funkin’ Around Debuts at #2! 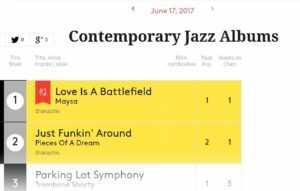 We are ecstatic to announce that Just Funkin’ Around has debuted at #2 on the Billboard Contemporary Jazz Albums chart! Pieces of a Dream, who are celebrating their 40th Anniversary this year, released the album on May 26, 2017. Thank you to all the fans who made this honor possible! http://piecesofadream.net/wp-content/uploads/2017/05/JustFunkinAround.jpg 500 500 Gar Roberts http://piecesofadream.net/wp-content/uploads/2016/10/POD-Only-Small-1.png Gar Roberts2017-06-08 08:40:082017-06-08 08:40:08Just Funkin' Around Debuts at #2!